Luckily I did take a photo of this sketch with my cell phone because the original was crushed and smeared on my return trip to the northeast. I could not make the background as beautiful as it appeared in the eyepiece in the desert sky by working with the cell phone photo...just did my best. I would have much preferred scanning the original sketch, but alas it's ruined. I'm going back in November and doing another sketch of this beautiful galaxy at the eyepiece will be high on the list! The galaxy took up almost the entire field of view in the Meade 24.5 super wide angle lens ( which is 20 years old and still a wonderful eyepiece ). Many mottled areas visible, two prominent spiral arms. NGC 604 was easily seen as well as some other HII regions that I've not yet identified. Sorry it took so long to post this one. This was the best view I have ever had of Messier 33. Edited by Randolph Jay, 20 October 2018 - 09:48 PM. Randolph, now you're cooking. Nice job, and glad you had an image to show us. 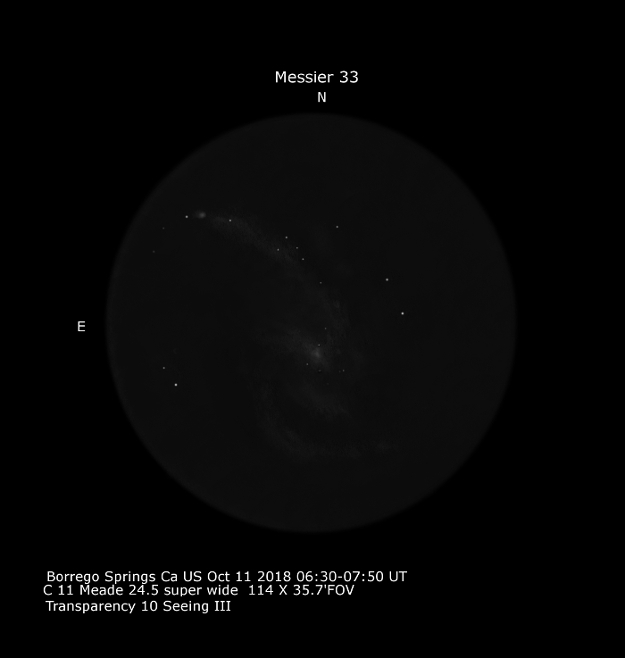 Messier 33 brings back memories of how challenging it is (for me.) I starred at it for over an hour. Oddly, I never did see the spiral arms as clearly as your sketch implies. But, I did manage to figure out where they were as well as their orientation. I see you got NGC 604. I also managed NGC 595. I am sure it was visible to you, too, just missed it. It's in closer to the core. Great work! And a proof that the C11 is a true deepsky telescope... When you get back in November, make sure you go after the emission nebulae. There's a map from Steve Gottlieb that you can use to hunt them down. Besides NGC 604, I think that NGC 592 is the one that was easiest visible. Thank you Norme and Martijn. Martijn I took a look at Steve Gottlieb's map of HII regions and stellar associations and have added labels to my sketch of possible candidates. Of course NGC 604 was blazingly obvious, but perhaps some of the other knots of brightness are some of these other HII regions and associations. This certainly will be revisited in November! "I think that NGC 592 is the one that was easiest visible." You may be right. I thought NGC 595 was. Maybe both. They are close together. I only spotted one of them, not sure which. Along with some clumpiness to the faint glow. Also got the impression, at least visually, the core was elongated. The thing about M33 is it has been a nemesis for many years. So hard to observe. But, we can actually make something of it. Beautiful. Nice one, Randolph. Might I ask where you observe when you are in Borrego? We are there for several months each winter in our RV and have been used to observing near our RV site. I also have been to the Star parties at the Lutheran church, where it is amazingly dark. Not sure they would want regular visitors using their property. Norme I meant to write NGC 595 not 596. This is all guesswork except for 604 which just jumped right out! I need to revisit this one when I'm there again next month. As I've mentioned, it was the best view to date that I've had of this galaxy. Thank you so much for your interest and encouragement! 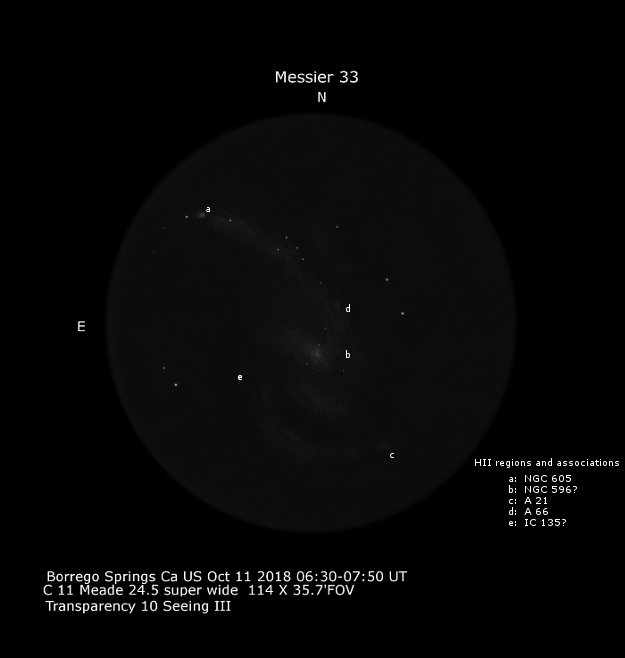 Nice sketch of Messier 33 (From Borrego Springs) . Too bad it got crushed and smeared on my return trip to the northeast. This guy's killin it with that C11 !!!! Randolph, you re inspiring the heck out of us here. Too, I'm glad you got the massive C11. What a beautiful able scope. Great work, you are where you need to be. Thank you Tom, Pete and Frank. I will be revisiting this one in a week or so and really want to see how many of those emission nebulae I can spot! A UHC could play big here.